What is a perfect fit coworking office? You need to find the right workspace. You need one that’s functional, inspirational, and able to serve your high-performing team. Maybe you want the space to help you attract and retain the best talent, or perhaps your goal is to foster collaboration and productivity while outsourcing the unnecessary office management tasks. With all the great coworking spaces in Denver, you can be sure you’ll find one to meet your needs. The problem is there are so many great spaces to choose from, and the search can be confusing. To help you sort through the numerous options, we’ve created this list of the top coworking spaces in Denver. Creativity must be nurtured, but many office spaces are uninspiring, boring, and often stifle creative inspiration. That’s where CTRL Collective comes in. CTRL Collective is a haven for Denver’s creative talent. With a clean and contemporary design and features like a suspended rope wall and steel encased fireplace, CTRL Collective delights your senses and provides the perfect atmosphere for doing your best creative work. CTRL Collective’s workspaces are furnished with lush leather and live edge wood tables, and the walls are adorned with spectacular art from local arts. The warm and welcoming community and beloved management team add to the many reasons we declare this spot the best workspace for creatives. Finding the perfect spot for an event is time-consuming and often frustrating, but it doesn’t have to be that way. 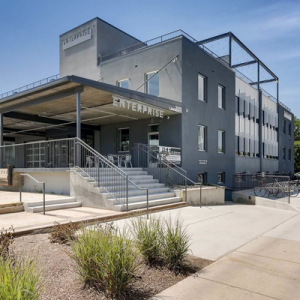 When you need to book any type of event space, Enterprise Coworking is the answer. With a large classroom that serves equally well as a training room or a theatre, and the adjoining kitchen and lounge with beer on tap, it’s the perfect space for team meetings, award banquets, and social events. However, the options don’t stop there. 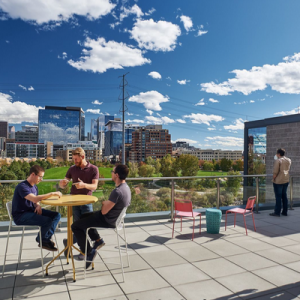 Our favorite space in this coworking building is the rooftop deck where you can see the sparkling city lights at night or soak up the warm sun on one of Denver’s beautiful blue-sky days. This rooftop space is perfect for everything from small team happy hours to big startup kick-off parties. Be sure to check out the upcoming Colorado Rockies season opener party Enterprise hosts each year. It’s a great way to experience Enterprise Coworking and its fun Rhino neighborhood vibe. Imagine working in a space that feels like home. Better yet, home with Mom serving breakfast each morning, healthy snacks in the afternoon, and networking-perfect happy hours in the evening. While this might sound a little too good to be true, it’s not. You can find this blissful workplace at Industrious. When people describe Industrious, they use words like “unique,” “welcoming,” “inviting,” and “a dream,” all of which are well-deserved distinctions. Industrious is open and bright, and the furnishings are luxurious and comfortable. It’s a place where you can settle in for some quiet productivity or hang out with friends and collaborate on projects. No matter the type of work you need to do, the hosts at Industrious provide best-in-class hospitality that puts Industrious on our top coworking spaces in Denver list. 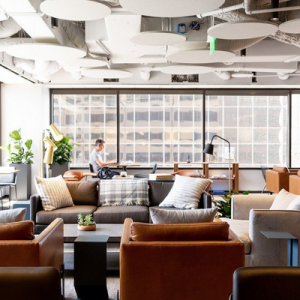 You might be thinking all WeWork spaces are created equal, but that couldn’t be further from the truth. Each WeWork space has its own culture and community, which means each space best serves different industries and workers. If you’re part of a startup organization in Denver, the WeWork The Lab in LoHi is where you need to be. The WeWork The Lab is a true team space where collaboration happens. There are plenty of meeting rooms, common areas, and outdoor spaces for teams to work. 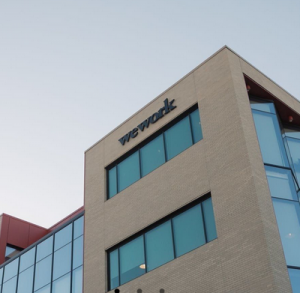 WeWork The Lab is hip, vibrant and full of Denver’s best startup talent, so there’s always an opportunity to network and collaborate with like-minded people. Of course, where there are startups, there must be beer, and WeWork The Lab has that covered too. The Denver Beer Company is downstairs and consistently serves as an end of the workday meeting point for Denver’s startup crowd. 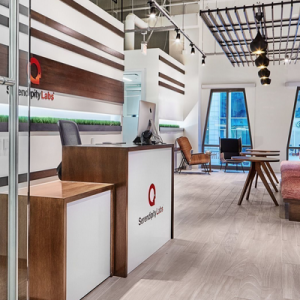 If a dog-friendly, beer on tap workspace isn’t your thing, we think you’ll like Serendipity Labs for its stylish professionalism. This space is perfect for impressing out of town clients, networking with like-minded professionals, meeting in private office spaces, or sitting down to get work done. 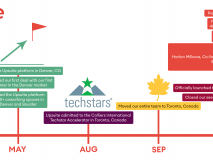 But when it comes to Serendipity Labs, professional doesn’t mean stuffy. Members have access to a large outdoor area with a putting green and plenty of comfortable seating. The LEED Gold certified building, located in the heart of Denver Greenwood Village, provides panoramic views of the city and easy access to shopping and dining. With all these features, it’s easy to see why Serendipity Labs is the best professional coworking space in Denver. When productivity is what you’re after, Venture X is where you need to be. With high exposed ceilings, floor-to-ceiling windows, and an industrial loft feel, this space is clean, modern, and distraction free. Venture X has a cafe’ to help you stay fueled during long work sessions and an outdoor patio terrace where you can get things done when the weather is nice. This is also one of the quietest workspaces in the city, with private phone booths for calls and tucked away meeting rooms for group collaborations. Focus and productivity seem effortless at Venture X, and that is why we recommend working or meeting here if being productive is essential to you. We already talked about a workspace that fosters creativity, but what about one that delivers inspiration? Inspiration for big ideas, out of the box solutions, and game-changing innovation. Well, look no further than Alchemy Creative Workspace in Wash Park. When you walk into Spaces, you immediately feel the magic of this coworking space. It’s breathtakingly bright, wide open, and visually stunning. 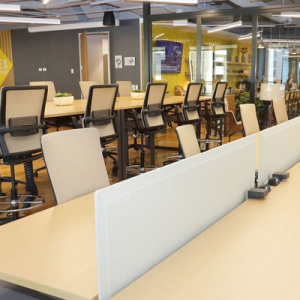 With 4300 square feet of open workspace for you to choose from, you’ll find the perfect spot for the work you need to do. Some of the many seating and workspace options include architect desks, couches, traditional tables, lounge areas, and restaurant style booths in the cafe. This unique space was inspired by workspaces in Amsterdam, and it’s spectacular. The community is energetic and collaborative. Working at Spaces makes you feel like anything is possible. You’re ready for new opportunities and able to achieve great things. If you work in technology in Denver, chances are you’ve already been to the coworking space that’s at the heart of the city’s newest tech scene, Galvanize Platte. 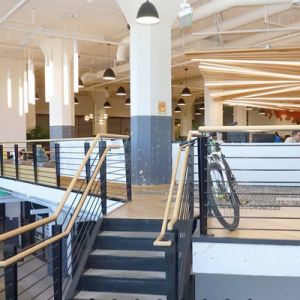 With neighbors like Pivotal Labs, Slack, and Xero, it’s no wonder tech teams call this space home. The workspaces in Galvanize Platte are clean, modern, and bright. 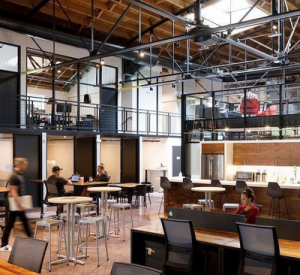 Galvanize Platte provides the perfect setting for tech-based innovation and collaboration. Galvanize also offers the largest selection of programming, web development, and data science courses in Denver. So, if working, networking, and collaborating with tech talent is what you’re after, Galvanize Platte is the place for you. The last coworking space on our list is a unique one. It’s a special community coworking space that thoroughly deserves its “best for collaboration” distinction. 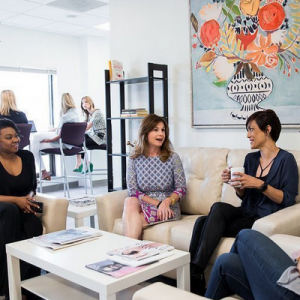 This workspace, RISE Collaborative, is both a workspace for professional women to conduct business and a curated community for women focused on growing professionally and personally. Shared connections and a strong community make collaborations effortless and enjoyable at RISE. As you would expect, the space is beautiful and luxurious. It’s located in Cherry Creek North, with upscale retail and dining options nearby. 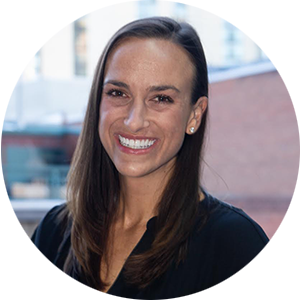 The RISE organization is mission-driven, holding events designed to foster professional development, mentorship, and of course, collaboration. 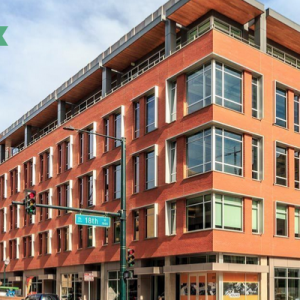 Now that you know more about Denver’s top coworking spaces, you’re probably ready to book one. We can help with that too. 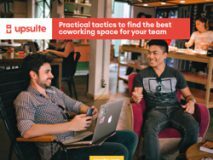 Upsuite helps teams find the coworking office that is the perfect fit for their business. Whether you want to book a free day or something long term, we can help you secure the right spot. 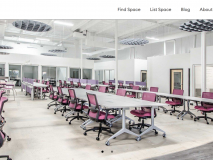 Ready to check out all the great coworking spaces in the Denver area? Connect with Upsuite’s local Coworking Advisor today to get started!